This year, FIAT is adding a new option to the Abarth, a six-speed automatic transmission. The 2015 FIAT 500 Abarth will be the first FIAT vehicle to offer the automatic option. Along with the now-available automatic transmission, the 2015 500 Abarth boasts a 1.4L 16V MultiAir® Turbo engine, along with twin intercoolers for more engine power. Available in four exterior colors – black, white, granite and red – the all-new Abarth comes with 16-inch hyperblack cast aluminum wheels or the available 17-inch forged aluminum wheels in black or white. Similar to the previous model, the 2015 Abarth features bifunctional halogen projector headlamps, fog lamps and a turbo boost gauge. If you prefer to customize the new FIAT 500 Abarth, there are three seat trim options available – Nero Leather, Rosso Leather or Nero Cloth. All models include high-back performance bucket seats, with firm side bolsters for added support. Other features include a leather trim steering wheel and aluminum pedal covers to accentuate the race-style design. When it comes to technology, the 500 Abarth provides a high-definition music experience with BeatsAudio™, along with six premium speakers, subwoofer and an eight-channel 368-watt amplifier. For easy navigation, the new Abarth features advanced navigation, with the available TomTom® Navigation System with Voice Comment to help keep you on the right track while on the go. Another added feature includes the EVIC (Electronic Vehicle Information Center) which displays vehicle speed, rpm, fuel level, engine coolant temperature and more. 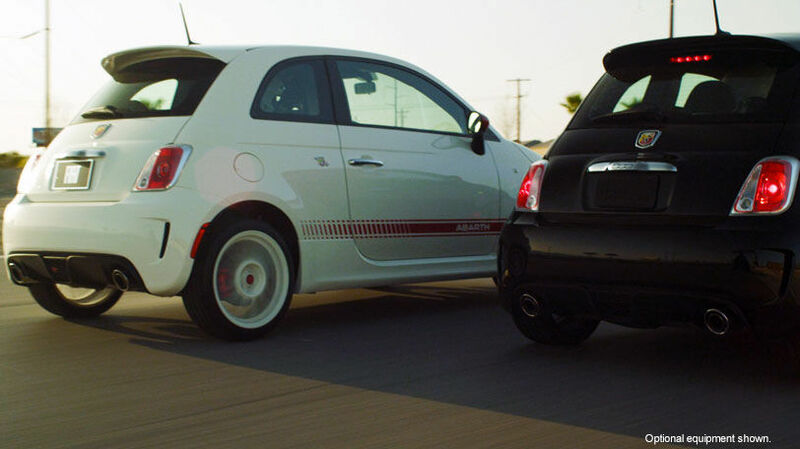 The 2015 FIAT 500 Abarth is all about security. With seven airbags surrounding the driver and passengers, along with a computer-designed steel cage encompassing the vehicle, energy from a crash is channeled away from occupants and instead absorbed by the front and rear zones. To help make parking less stressful, the Abarth features the Park Assist System to alert drivers of any large or small objects behind them. Last, but not least, to help drivers maintain control, a three-mode Electronic Stability Control system is integrated into the 500 Abarth. If you’re looking for a new FIAT, consider the all-new 2015 FIAT 500 Abarth – now available with manual and automatic transmission options. The new 500 Abarth is now available, with a MSRP of $23,045. Parks FIAT of Wesley Chapel is your Tampa area-FIAT dealership. Located at 28647 State Road 54, stop by our dealership to test one of our new FIAT models or used cars for sale. Categories: 2015 FIAT Models | Permalink.